What accessories should I purchase when I buy a wood burner, brazier, fire-pit or pizza oven? When purchasing your first wood burner, there are a few accessories you’ll want to invest in. These accessories will help keep your fireplace clean, running efficiently and, most importantly, safe. Even if your fireplace has glass doors, a screen is needed to keep little hands and paws away. Look for options made with heavy-gauge steel mesh. A three-sided screen has an adjustable fit so it works with most fireplaces. A tool set is a must for keeping your firebox clean. You’ll want a set made of a solid metal (we suggest wrought iron) that includes all the basics: a long-handled shovel, poker and brush. An indoor log rack allows you to stock up on wood without having to trek outside into the cold every time you need to put another log on the fire. Your ash, even if your fire is completely out, will still be red hot, and many fire owners have the melted plastic bucket and ruined carpet to prove it. Clean out your fire safely using a metal shovel and metal bucket. Hot ash could also melt your plastic wheely bin, so leave ashes in your metal bucket in a safe place overnight so they can cool down before putting them in your wheely bin. It is unlikely that your fireplace or wood burner will give you any trouble, but it’s better safe than sorry. A fire extinguisher is a must-have item for your home regardless of whether you have a fireplace or not. Smart Burn is a multi-award-winning device that makes your fire burn more efficiently, producing fewer emissions and less smoke – up to 50% less. Your fire will burn cleaner – no more blocked chimneys and streaky glass fire screens. Scientifically tested, SmartBurn is a natural device, made from non-toxic ingredients, which will also produce up to 17% more heat from your fire! When installing new turf most people think of the obvious concerns – how much turf do I need? Will my turf get enough sunlight? How often will I need to water my turf? – Most of us would not even think about Soil pH. pH is the measure of how acidic or alkaline soil is, its’s measured on a scale from 1 to 14, soil with a pH measurement of below 7 is acidic, while a measure above 7 is alkaline. Having the correct soil pH for your turf is very important, as pH influences soil structure, nutrient availability, soil bacteria and toxicity. Testing for pH is very easy, you can either buy a pH testing kit or do it yourself with some common items that can be found in your kitchen cupboards. To do it yourself you will need, vinegar, baking soda, two clean bowls, distilled water (not tap water) and some soil from you yard. Firstly put a couple of spoonfuls of soil into one bowl and add ¼ to ½ cup of vinegar to the soil, if the mixture fizzes you have alkaline soil and you soil pH is likely between 7.5 and 9. If no reaction occurs take a couple of spoonfuls of soil and mix with the distilled water in the second bowl, then add ¼ to ½ cup baking soda. If the mixture fizzes you have acidic soil and the pH is likely between 6.5 and 4, if your soil didn’t react to either test than you have neutral soil with a ph of 7! Be sure to get soil samples from a couple of different areas in your yard as pH can vary. BC Sands stocks the Sir Walter Buffalo Turf, Sir Walter grows best in soils with a pH between 6 and 8. There are a couple of way to change to pH of your soil to best suit your new turf, the easiest way is to add soil that has a known pH range. BC Sands stock Turf Gro Premium Top Dressing & Underlay, Turf Gro has a pH range of between 7 and 8 and is specifically formulated to support the growth of Sir Walter Buffalo Turf. Alternately you can lower the pH of your soil by adding compost and manure (except chicken/poultry manure) to your soil, as the compost/manure breaks down it will make your soil more acidic. If you need to make your soil more alkaline you can add lime or chicken/poultry manure, as it breaks down it will increase the pH of your soil. Create an eye-catching front or back yard feature by shaping a few cubic meters of topsoil into an undulating berm (little hill). Topped off with mulch, groundcover and bushes and small plants, a berm adds interest and buffers street noise. Around 3 cubic meters of soil is enough for a good-sized berm as well as some ground cover like mulch. If unsure of the amounts you need, measure out your berm and ring our sales team on 8543 3400 or bring your measurements into our Taren Point or Mascot yards and talk to staff. Tools: Wheelbarrow, spade, shovel, garden rake, Hose and a trowel. Use a charged hose to outline the berm, you could make a simple circle, a kidney shape, a rounded corner rectangle. Remove soil about 1/2 a meter in from the perimeter and start building up your berm. The secret is to channel your inner child and remember all the times you built sand castles on the beach (and burried your little brother up to his neck and got yelled at by dad). A day to form the berm, another half-day for planting and mulching. Installing a surround for your trees eases mowing, protects them from being ringbarked by your whipper snipper and looks great. All it takes is digging a circular trench, adding some edging, and shovelling in some ground cover like the pebbles, mulch, decomposed Granite or one the myriad of other ground cover options. Edging; Either Bricks, Gardenstone blocks, Linkedge (super easy to install and very subtle), Treated Pine Sleepers or a pre fabricated concrete tree surround. Plus some ground cover to put in your circle. If unsure of the amounts you need, measure out your surrounds, ring our sales team on 8543 3400 or bring your measurements into our Taren Point or Mascot yards and talk to staff. Tools: Rope, spade, trowel. To create a nice, even circle around the base of your tree, tie a big loop of rope around your tree. Adjust the length of the loop so when you pull it taut, the free end is right where you’d like the outer edge of the surround to be. Set your spade inside the loop with the handle plumb – straight up and down. Now, as you move around the tree, the loop of rope keeps the spade exactly the same distance from the base of the tree, creating a nice circle. Use the spade to cut into the turf all the way around the tree. Remove the rope, and dig out a circular trench to suit your particular . Add a layer of sand. Set bricks at an angle for a pleasing saw-tooth effect or lay them end-to-end. Fill the surround with around 100mm of chosen ground cover. All products from this post can be purchased online or instore. ONLINE: bcsands.com.au Order online (including delivery day and time) 24/7! Mascot: Ross Smith Ave Mascot (Off Butler Rd Exit, near Blu Emu Long term carpark at the airport). The weather is starting to cool and with April being a typically wet month, it’s time to sort out your yards drainage. When correctly designed and implemented, drainage works cannot be seen, but that does not change the fact that garden drainage is one of the most important elements of the garden to get right. Poor drainage creates a range of problems for gardeners. These include boggy lawns, the death of plants, and even undermining the foundations of your house. Excessive amounts of water running off garden beds or off overhanging roofing or canopies can bring silt and clay to the surface, causing mud to form and waterlogging of the subsurface. Sloping blocks can be the cause of unique drainage problems. Water at the base of the block can be drained / soaked away using an agg pit, which is a deep pit filled with aggregate (like cost effective recycled aggregate Fig 1.) and covered with topsoil. If the problem is severe, a subsurface drain may be required. Soil that is naturally water retentive such as clay soil can result in a drainage problem. This may be combated by placing pits at the edges of the garden to drain off accumulated surface water. Human factors also affect the natural drainage of the garden. Driving vehicles over it, the building process, or even heavy foot traffic, can compact the soil and stop it from absorbing water like it should. Be aware that drainage is essential if you have recently built or renovated your home and the natural contours of the soil have been altered. Legally, you may be responsible for any alteration or change to the natural flow of water that causes damage to your neighbour’s property. To check how well your soil drains, dig a hole that is 30cm by 30cm by 60cm. Half fill it with water. If you have good drainage, the hole should be empty within a day. If you have a severe drainage problem, the hole will actually contain more water. 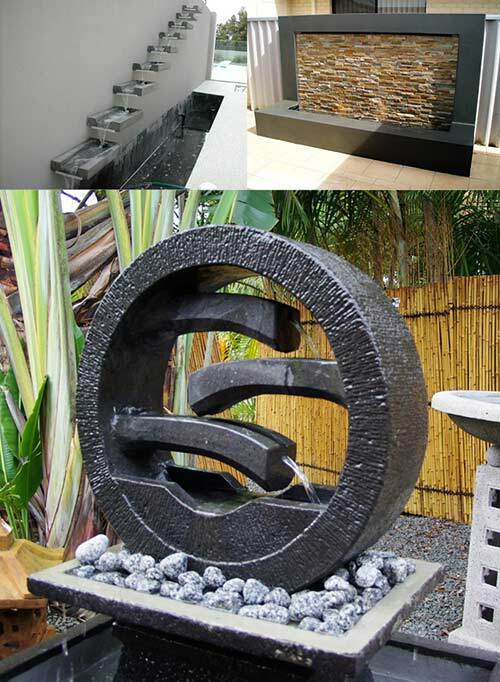 There are two forms of drainage for the garden – surface or subsurface. Surface drainage, as the name implies, collects and redirects the excess water that is on the surface of the ground. It is used to catch rainfall before it causes damage and direct it elsewhere. Spoon drains are shallow channels that are usually made from concrete and can be installed around the garden to redirect this excess water to other parts of the garden or to inlets for subsoil drainage systems. Large paved or concreted entertainment areas use spoon drains covered by a small grille which then directs the water to a stormwater system. Subsurface drainage systems are buried beneath the surface of the soil so ideally a landscaper would install this in the early stages of landscaping. However, they can be installed in existing gardens. Subsurface drainage is commonly used in grassed areas and must used behind all retaining walls. Specially designed pipes, called Ag Flow Pipe, are used to collect and move the excess water away. Trenches need to have a slight angle in order for the water to flow in one direction towards an outlet system. Subsurface drainage systems commonly use geotextile fabrics around the pipes in order to stop soil and other particles from blocking the drains. It is a good idea to have a professional such as a plumber or a landscaper (if you need a referral of a reputable plumber or landscaper, give us a call and we can recommend one to you, to install a drainage system to ensure that it is laid out correctly. If it is badly designed or installed, the system may block up, direct water to the wrong outlet system, or may be insufficient. The type of drainage system that you choose to use in your garden will depend on the extent of the problem. If it is just a mild problem, the problem may be solved by designing the garden so that the water flows into pits up to 1.2m deep. An agg pit or drainage cell (product name VersiCell, Fig 3.) are other options. An agg pit is a large hole at the lowest part of the yard filled with aggregate, like blue metal or recycled aggregate, and then covered with 30cm of soil. The agg pit drainage may need to be as large as 2m by 2m to have the desired effect. You could also choose a subsurface system that makes use of Agg pipe Fig 2. Made of crush resistant moulded plastic, they are covered with geo fabric to stop the pipes becoming clogged. Always lay pipes above the water table otherwise they will just be draining groundwater, instead of water coming from the surface. The pipes should be slightly sloped to encourage drainage. All pipes should terminate in an, agg pit or drainage tank. For help in regards to your drainage project, feel free to give us a call or drop into our Taren Point or Mascot branches. Humans have been digging in the Earth since the dawn of the Neolithic Revolution, some 12,000 years ago. While the earliest agriculturalists had to make do with shovels crudely fashioned from animal bones, shoulder blades were a popular choice, later material advances (namely stone, wood, and metal) led to the development of modern shovel designs and their specialized heads are purpose-built, like shovels for digging in solid soil and shovels for moving loose material, like pebles. Today, shovels come in a myriad of shapes, sizes, and functions. Digging shovels are designed for doing just that. They feature a slightly curved scoop with upturned edges and either a pointed (center) or flat (left) tip. Pointed tips are generally used for digging and planting in soft, tilled soil while the sharp flat tips of square points are utilized more for heavy-duty hard-packed soils that demand more force to penetrate. Square point shovels can also perform many of the same functions as garden shovels (right) – lawn edging, transplanting small bushes and trees, cutting turf and small roots, dividing perennials, and trenching. Their handles are available in wood, fibre glass, or metal. Narrow Trenching shovels are designed for, you guessed it, digging and clearing narrow trenches. They feature a sharp tip and squared sides to produce clean trench walls and minimise disruption of the surrounding soil. They’re indispensable for laying irrigation pipes, digging a compost trench, and removing deeply-rooted plants. As the name suggests Post Hole Shovels are ideal for digging post holes. They range from wide to very narrow with slightly curved sides and a rounded tip. Come for the holes, stay for the workout. Post hole diggers are essentially two shovels connected by a hinge. They’re used to penetrate loose, preferably tilled, soil (after using a pick axe, shovel, or autotiller to break up the surface) and cleanly excavate columns of dirt to create deep narrow holes for the sinking of fence posts, bulbs or patio supports. Just make sure your back and shoulders are up to the task. Broad and wide-flared with a flat tip, scoop shovels are terrible at digging but fantastic at moving loose materials like blue metal or pebbles (top) or light weight materials like mulches and bark (bottom). There’s a lot more to a planter box then just a large box with some soil in it, you have to use the right materials, in the right proportions in the right order. BC Sands expert staff, together with some or our industry expert clients have developed this easy to follow Planter Box guide. Step 1. Make or purchase a planter box. You can make your planter box from bricks, blocks or timber depending on your needs and taste. BC Sands has a wide range of bricks, blocks and treated pine timber. Give us a ring, drop by the store or visit the website for material options. Step 2. Ensure your planter box has adequate drainage by drilling 10mm holes in the bottom. Step 3. The inside of your planter box needs to be waterproof. This is easily achieved by painting the inside of your planter box with a waterproofing membrane. This ensures your planter box in watertight and water only goes where you want it to go, down the drainage hole/s. Step 4. Line the planter box with protective board or corflute. In the bottom of your planter box add a drainage cell. Have no idea what corflute or a drainage cell looks like? Don’t worry, our helpful staff will help your get everything you need. Step 5. On top of your drainage cell add a layer of Terrafirma / Geotextile. Lay this fabric over the drainage cell and up the sides of the planter box. To attach the fabric to the sides of your planter box, use either a staple gun, flat head nails or specialised fabric nails. Step 6. The next layer is a 100mm layer of aggregate (blue metal). If you give BC Sands staff the measurements of your planter box, they will work out how much of each layer you require. Step 7. Cover the gravel with another sheet of Terrafirma / Geotextile fabric so the gravel doesn’t mix with the soil. Step 8. Add some high quality, planter box specific, soil mix. It is important that the planter box mix is specifically designed for use in a planter box, otherwise you risk the soil becoming Anaerobic (which means ‘without air’ and can lead to potentially toxic bacteria! Not only dangerous it also leaches an unpleasant smell. You may need two types of planter box mixes depending on the depth of the planter box; Planter Box A Mix and Planter Box B Mix. Planter box A goes down first and needs to be around 200mm deep. Then Planter Box B mix goes on top of the Planter Box A mix. Refer to the diagram on page one for a cross section of the various layers. Step 9 . Plant your favourite vegetables, plants and flowers, either from seeds or small plants. Follow the plant / seed instructions for depth and distance measurements. Step 10. Spread 50mm – 100mm of mulch on top of the Planter Box B mix, sit back and admire your handwork. The friendly staff at BC Sands can help you select all the right materials for your planter box project. Give us a call, order directly from the website or drop into one of our two convenient locations. BC Sands has a huge range of all the products you need and a range of delivery solutions so you can get your mulch exactly where you need it. Avoid pruning any shrubs or trees that are going to flower or fruit in late autumn, winter or early spring. Camellias, Azaleas and citrus trees are a few that will be just about to flower or are already bearing fruit, so pruning is not an option until after they have finished flowering or, in the case of fruit trees, yielded their crop. As for planting new trees and shrubs, there is an old saying that “Autumn is the time for planting” so, if you are wanting to do some new planting, now is the time. The lower temperatures and shorter days means that new plants can gradually settle into their new home before facing the rigours of a hot, wet Summer. Most trees and shrubs will be grateful for an application of fertiliser at this time. The theory behind this is that it sends them into winter well nourished, so that come spring they are perfectly poised to make new growth and produce flowers and fruit. Visit our website or pop into the store to see our large range of fertilisers. Now also is the time to sow seeds of annuals, including Iceland poppies and cineraria, as well as being the ideal time to sweeten the sweet pea beds with dolomite so you can plant seeds or seedlings in another month’s time. And you had better get cracking and build a trellis for them to climb. If you want to grow spring-flowering bulbs such as tulips, ranunculus and freesias, buy them as soon as possible and place in the crisper bin of the refrigerator for four or five weeks before planting out. It is in the vegetable garden where you can really get involved as the list of vegetables that can go in over the next few weeks reads like an online seed store catalogue. Because most of the vegetables that we grow originated in Europe, they appreciate the cooler, less humid weather so that means you can plant beans, even broad beans, carrots, the much under-rated kohl rabi, peas, capsicums, tomatoes, celery, cabbage and broccoli. Autumn is also good time to plant carrots, parsnips and brussels spouts. If you’ve been growing pumpkins, cucumbers or zucchinis and they produced only male flowers, you might just as well pull them out and replant another crop because they will be unlikely to change their flowering habit now. Similarly, if you had tomatoes that didn’t produce much and are now seriously wilting, they may as well go to the tip and be replaced, but do replant in a different part of the garden. Now is the right time to fertilise your plants. If the tree or shrub is being grown for its leaves and not for flowers, a complete lawn fertiliser would be all right but, if there are flowers involved, a citrus and fruit tree fertiliser may be the go. Far better to buy a plant-specific fertiliser, then you’ll be sure that you have the right one. In the flower garden it isn’t too late to dig up and divide perennials such as agapanthus and daylilies, while a bed of petunias that has finished flowering can be cut back to about 30mm above the ground and given a good watering with a soluble flower fertiliser. More often than not they will reshoot and you’ll get a second flowering. Remove non-productive pumpkin, cucumber or zucchini plants. Call time on those wilting tomato plants. Fertilise trees and shrubs to ensure they are nourished before winter. Dig up and divide perennials. Sow the seeds of annuals. Get your spring flowering bulbs (tulips, ranunculus and freesias) and store in the fridge for a month before planting. Trim the leggy growth on pelargoniums and geraniums. Avoid pruning shrubs or trees that are going to flower or fruit in late autumn, winter or early spring. Avoid fertilising azaleas as new leaf growth will hide the flowers. BC Sands has a large range of fertilisers, soils, landscaping materials, gardening tools and everything else you need for Autumn prepping your garden. (Next to the Blu Emu Carpark near the Airport). The two biggest mistakes homeowners make when watering their lawn are using too much water and watering at inappropriate times. Lawns need far less water than most homeowners assume: Depending on lawn and soil types around 20mm each week is more than sufficient for the most luxurious lawn. A rain gauge can be a useful tool to measure how much water the lawn has received, or a simple tuna can or container of similar depth can substitute. If the lawn receives regular rain, additional watering is usually unnecessary, and excess moisture may even damage the lawn. Yellow or pale grass is a sign of over watering. To make the most of lawn maintenance and watering, it is vital to water at appropriate times. Watering the lawn in morning or midday can be a waste: much of the water will evaporate before it can be absorbed. The best time to water is in the late evening, after the sun has set, or during the early morning when the air is coolest. Furthermore, the lawn can drink best if the water is added all at once. Watering for just a few minutes every day only provides enough moisture to reach the upper roots, while the lower root system continues to dry out. This may damage the lawn by making it more susceptible to surface damage. Watering for a longer length of time on fewer days allows the deeper roots a sufficient drink and will easily sustain a healthy lawn. Position sprinklers to avoid wasting water on house walls, driveways, and other non-lawn areas. Move sprinklers and hoses periodically to avoid damaging the grass they rest on. During the summer, it is easy to combine lawn maintenance with outdoor fun. Children love playing in sprinklers, and by moving the sprinkler to different parts of the lawn while they play insures that every blade of grass has a drink. Similarly, letting children control the hose under parental supervision not only gives them a fun way to cool off, but also introduces them to household chores and responsible lawn maintenance. If a kiddie pool is a common plaything, empty it over different parts of the lawn to recycle those litres of water. Homeowners have more litres of water at their disposal than those that come from sprinklers, hoses, and watering cans. A little creativity can help conserve water and lower summer water bills while caring for a gorgeous lawn. Need to wash a car? Drive it onto the lawn and take advantage of every runoff drip as extra lawn care. The same technique can be used for washing pets or rinsing off outdoor furniture and toys. Can laundry water a lawn? Absolutely, with greater savings than most homeowners imagine. Skip the spin cycle to cut electricity bills and string the dripping garments over a clothesline to let them give the lawn a drink. After a BBQ, empty Esky’s over the lawn to reuse the now melted ice to refresh the grass. Where else can you find a few extra drops to recycle on lawn maintenance? When cleaning a fish tank, pour the used water onto the lawn instead of down the sink. Toss used ice from cool drinks onto the lawn instead of down the drain. If water bills are “too big a drip in the budget” and the homeowner is drowning in lawn care, low-water landscaping (called xeriscaping) can solve both issues. When replanting flowerbeds or bushes, choose drought-resistant plants. The best flora are those native to the region, since they are naturally accustomed to the level of precipitation and will require less additional water. Not only will they help reduce water bills, but their natural beauty will enhance the home’s value. If installing new plants is too much trouble or expense, simply removing plants reduces water consumption. BC Sands has a large range of decorative rocks, pebbles, mulch and bark in a range of colours and styles, and a rock bed accented with a statue, gazing globe, or birdbath can be a unique and attractive alternative to thirsty flower beds. Consider adding a path or wider landscaping curbs to further decrease the overall lawn area. From summer fun to creative recycling, homeowners have many options to water their lawns without opening the flood gates on high lawn water bills. Each step may only be a small drip in the bucket, but they can add up to saving plenty of water and money while managing a healthy lawn that families will enjoy all year round. Want to keep the kids occupied during the school holidays? Easy – Build them a sandpit. In this issue of the Sandpaper I will go through the steps to build a sandpit for the kids. Do not burn Treated Pine off cuts as they contain toxins which are released when burnt. Wear an approved dust mask, eye and ear protection when cutting, planing or sanding timber. All Australian building sites have a zero alcohol limit, when using tools in your own home you should adopt a similar policy. Dial before you dig – before putting pick to dirt give these guys a call or look them up online. Wheelbarrow (may not be needed if you choose to have your sand delivered in bulka bags with one of our crane trucks. We can lift the bag over your fence and put it into or right next to your sandpit. Saving you time on labour! Will there be enough shade? What size do you want the sandpit to be? Use a string line or piece of strait timber as a guide and a builders square to ensure corners are at 90 degrees. Once the sandpit is laid out, start to excavate the selected area to about 200mm below the grass line or finished sand level. Note: if you are planning on using the sandpit as a ‘soft fall area under a tree or cubby house it is recommended that you make your sandpit 300mm deep. Don’t throw out the dug up turf, you can use it to repair bare spots in the lawn, or you can put it upsidedown in the compost bin. Any dark-coloured top soil can also be put in your compost bin or scattered around the garden. Prepare a reasonably level bed for the sand to sit on If your subsoil is clay or hard you may face drainage problems. If this is the case install a perforated drainage pipe, drain tile or a deep hole in the centre of the sandpit and then cover with crushed rock, stones or coarse gravel and replace soil. Fasten together using galvanised nails, spikes or batten screws. Use 50x50mm pegs every half a metre to hold the sleepers in place. Fill the sandpit with sand. It’s important to order washed Sydney or Newcastle sand or to let BC Sands sales staff know the sand is to be used in a kids sandpit to ensure you get the right sand. Depending on the size of your sandpit you can choose to pick up your sand in 20kg bags, borrow a courtesy trailer, have it delivered on a tipper truck or in 1 tonne bulk bags. 1. You save time and effort by getting the sand exactly where you need it. Some of our crane trucks have a reach of 13m, so we can get your delivery over fences and pools etc. 2. Because BC Sands use multi-use bags you can keep the bulk bag and use it in the future as a skip bin bag which you can fill at your leisure and ring us to collect when ready. There was a time you could kick back in glorious solitude right in your own backyard. Then the people next door cleared some trees… And on the other side, the neighbours new master bedroom with walk in robe and 7 person spa also includes a second-story deck with nice views, right into your yard. Suddenly, you feel like you’re living in a fishbowl. In this post we explore some ways create privacy again in your yard. As larger houses occupy ever-smaller blocks and the demand for outdoor living areas grows, privacy is at a premium. And it’s not just about prying eyes invading your space—you may want to shield your own view of your leather skinned sunbathing neighbours and also block out their chatter / screaming at the TV for their favourite team to “Just tackle him”. There are many ways to add privacy in the landscape, from putting in perimeter plants to building fences, stone walls, or garden structures. Below are a few options to consider. If you haven’t already, the quickest way to gain some extra privacy is to put up a nice 6ft colourbond or hardwood fence. This option can be quite unattractive and may not give you all the privacy you desire, especially when trying to block out two story houses. There are a number of simple ways to ‘soften’ a new or existing fence. 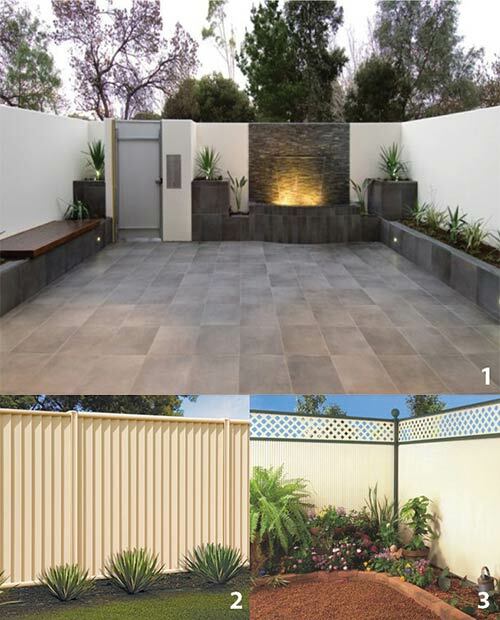 From simply planting some flaxes at the base of your fence (Pic 2), planting a layered garden (pic 3) or putting planter boxes and seating in front of your fence to create a real wow factor (pic 1). Don’t be afraid to mix in a small tree or two for extra height, colour, and texture. Boundary plants can provide year-round screening and are typically not restricted by council restrictions limiting their height. Before you buy your privacy plants, you need to work out how big you want them to grow. If you don’t know how tall or wide you want it, your nursery staff wont be able to give good advice. Of course you want to choose a plant that you like but some other factors need to be considered as well. Sunlight/shade, height, how much room do you have available, are there any pathways or structures that could be damaged by plant roots and any required maintenance. Prepare the soil, ask the staff at BC Sands to help you with soil selection. Make sure they are evenly spaced and have even growth at the bottom of the plant. Fertilise hedge plants three times per year, at the end of winter, around Christmas and again in March. Watering – New plants require more watering than established ones. Check the moisture at the base of the plant every second day for approximately 6 to 8 weeks after planting. BC Sands has a large range of soils, slow release fertilisers and watering equipment, buy online, call or come into the store. Our staff have the ‘know how’ to make sure you buy the right equipment and products for the job. Potted plants can be positioned to create a green screen around any small area. Ideally, pots should be raised up on casters or drip trays and / or made of lightweight materials so you can easily move them for parties or deck repairs. Screening is another option for instant privacy. Even if you’re not literally seeing eye to eye with the neighbours, you might still be close enough to hear their conversation. Or you may be bothered by intrusive traffic noise or buzzing AC unit. Hedges are quite good at blocking noise but you may also want to consider adding a fountain to your privacy plan to mask unwanted sounds with pleasant white noise. They range from off-the-shelf, plug-in units that sit on a table or hang on the wall to custom designs that become a major focal point. Keep in mind that flowing water becomes louder the farther it falls and the more tiers it travels over. It’s possible for a fountain to be too loud, which can be just as disruptive as the noise you’re trying to hide. All fountains have a re circulating pump, so if you get an adjustable one, you’re sure to find a sound level that’s soothing. Written by Leo Stanners – Marketing Manager, BC Sands. www.bcsands.com.au – Order online 24/7.